Might the ALP walk away from carbon pricing? Is there a battle brewing between Shorten and Combet for leadership of the ALP after the election - if they lose? Is Shorten sounding out colleagues about walking away from the carbon price like the Coalition did with WorkChoices? From Business Spectator: "… some strong proponents of climate change action believe Bill Shorten has begun lobbying members of Caucus to abandon carbon pricing as a Labor policy after the next election. The argument follows the precedent set by the Coalition over WorkChoices – though many in the Liberal and National parties believed it was the right policy, they were required to disown it after the 2007 election so as to avoid spending years in the political wilderness. After the 2013 election, Labor could be tempted to walk away from its own electoral poison – CarbonChoices, if you will. When I put this to Shorten’s office, the standard response applied: he won’t speculate about hypotheticals that involve Labor losing the election. 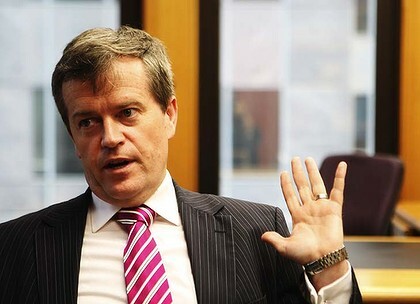 A spokesman told Business Spectator that Shorten was “strongly committed to carbon pricing and that hasn’t changed”. Another Labor MP said Shorten was “quite capable” of such a policy backflip. Left faction leader Senator Doug Cameron also refused to comment on “hypotheticals that involve Labor losing” but added that after the election he would have a “very strong view” on any such idea. But there is more to this than tight-lipped ‘no-comments’. One senior Labor operative, admittedly no friend to Shorten’s Right faction, said the leadership spill precipitated by Simon Crean in March would have hinged on five votes offered by Shorten, via Crean, to get Rudd over the line. However, it’s a widely held view that the votes were bait to draw Rudd out and that they would not have been delivered. Had Rudd stood, his leadership ambitions would have been thwarted a second and final time. As it happened, this did not have to occur. By not standing, Rudd even more decisively ended his leadership push for all time. A ‘CarbonChoices’ strategy would have two effects. Firstly, it would allow a new leader (neither Rudd nor Gillard) to say about carbon pricing what the Coalition said about WorkChoices – it’s dead, buried and cremated – and focus on the more successful parts of Labor’s legacy. That is, ‘we had great economic numbers, got the NDIS and schools reform done, sorted out the Murray-Darling ... and only made one mistake, which is why we’ve buried carbon pricing’. Secondly, it would eliminate the threat of a leadership challenge by anyone who was deeply involved in that unpopular policy. And who, besides Shorten, is in the frame as a potential leader if Labor loses the election? Why Greg Combet, of course, minister for climate change." Tags: "bill shorten" "kevin rudd" "greg combet" "doug cameron" "simon crean" "australian labor party" coalition "carbon price" "double dissolution"